Whenever you ask someone to name the best places to eat and drink around Ryerson University, they'll usually respond by saying, "Ryerson is a university?" Har har. I spent four years at Ryerson (let's just leave the name at that) and countless meals there in the process, quickly learning where to go when Timmies simply won't suffice. While Ryerson proper only sports a few quality spots to grab something to eat or drink, the area around the campus has plenty of places to choose from. 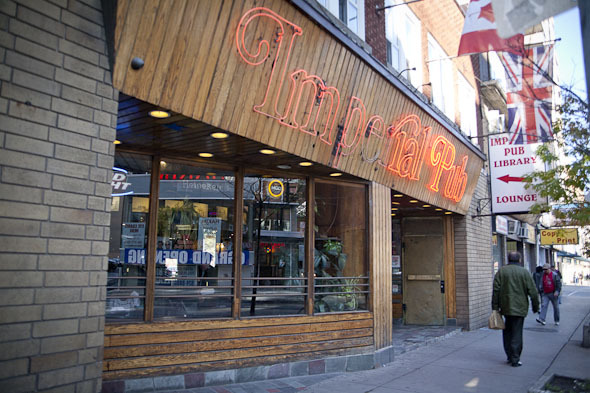 Here are some places to check out in and around Ryerson University. Oakham Cafe is the place on campus to pick up a cup of fair trade coffee. Recently undergoing a bit of a transformation, the cafe now showcases local art, which you can admire while dining on a "Student Loan Special" breakfast for $3.75, or else a heartier meal of Penne Italianio or Quiche of the Day. The Eaton Centre was never worth a lunch trip during my time at Ryerson, but the recently unveiled Urban Eatery would certainly now be worth a saunter. All the chains are there, of course, but there's also Urban Herbivore, RARE, Ruby Thai, Froshberg Gelato, Big Smoke Burger, and other outlets I wish had arrived just a few years earlier. Sigh. 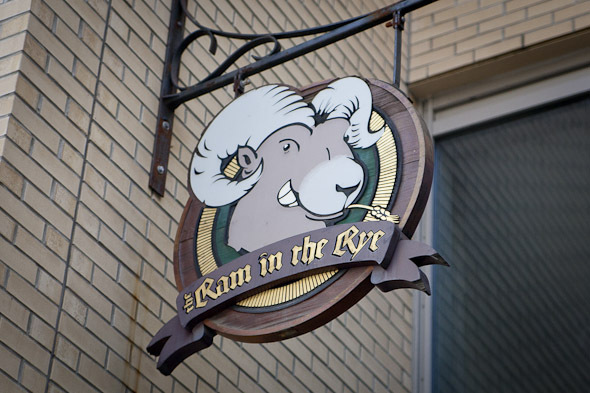 In my experience ('anecdotal is the best evidence', and other things I learned at Ryerson...) The Ram can be very hit or miss. I think I lived off its delicious buffalo-style chicken fingers during my time in undergrad, though sometimes it felt like I was practically wasting a semester waiting for my food to arrive. Cheap pints, great nachos, and the aforementioned fingers won my heart, however. When Ryerson's new athletic facility opens in the former Maple Leaf Gardens, Hair of the Dog will be right across the street from the ever-expanding Ryerson campus. For now it's but a brief walk from many of Ryerson's buildings, meaning there's a delicious Caesar to be had in just a few minutes. Plus crab ravioli, if you're feeling like something extra. My favourite Ryerson brunch spot and the epitome of "greasy spoon." I've spent many a morning scraping the syrup off my empty French toast plate, which is probably why I was so often late to class. 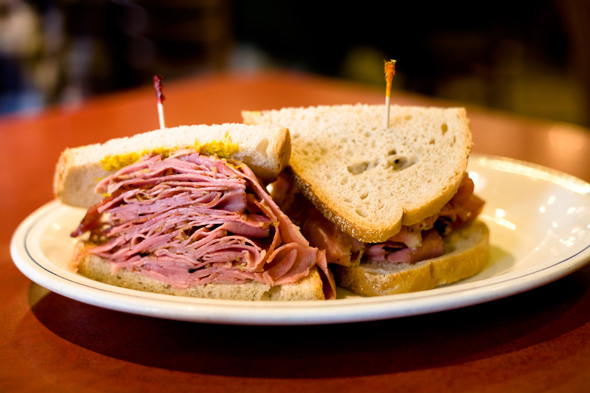 Fresh sandwiches, salads, smoked meat, and more, and pay up at the cash before you leave. A bit of a dive, but awesome because of it, and you'll probably want to head up to the second floor. The main floor is informally for the regulars and daytime drinkers, but you'll probably find the popcorn machine upstairs anyway. The food is the typical pub fare and the portions are decent, but it's more the aura of the Imperial that makes it a hidden (ish) gem. If my insufficient wardrobe is missing one thing in particular, it's an "I Survived the Salad King Hiatus of 2010" t-shirt. Students wandered aimlessly around Yonge and Gould for weeks after the infamous wall collapse, searching for their beloved shrimp panang curry or Thai basil noodles. Thankfully, delight returned to the area in the form of a brand new across-the-street location, where students are even willing to tackle a whole flight of stairs to get to their meal. For some quality Japanese, you'll want to head to Guu. The restaurant has a cool vibe and even cooler list of authentic Japanese offerings including Chazuke, Natto, Gomaae. Not a spot to grab some sushi (for that, try Sushi Tower or the AYCE at the Kyoto House west of Bay St.), but a good option for an after-exam celebration. Ryerson business students may be, for the most part, separated from the rest of campus, but the Bay/Dundas location of the management building means they are that much closer to Kenzo. (At least there's one advantage to getting a Ryerson BComm, eh?) 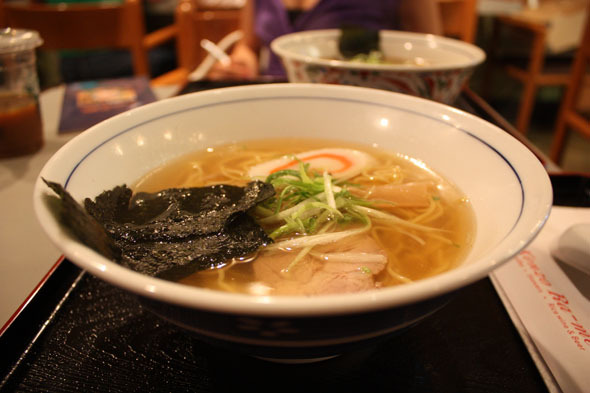 Kenzo offers its miso ramen, orochong ramen, karashi ramen hot and fresh along with the rest of its menu, and-fortunately for students--at very reasonable prices. What did I miss? Add your favourite spots to eat around Ryerson University to the comments below.